No problem is a pleasure. and, yes i belive F6U is the only one that is still missing ATM. Here is F6U, one of my favorite planes. Edited by Pertinacious, 13 March 2015 - 03:22 AM. Looks like the list is finally complete. Many thanks for finishing it Pertinacious. Edit: For future parade camouflages, I'd recommend creating a new thread as I'm not going to update my OP anymore. Do link my OP with yours if it helps though. Thanks again! Edited by Wolcott, 29 August 2015 - 08:32 AM. The addition of the I-7 and 2PA-L (a return in the latter's case) means there is more material to add to this thread! 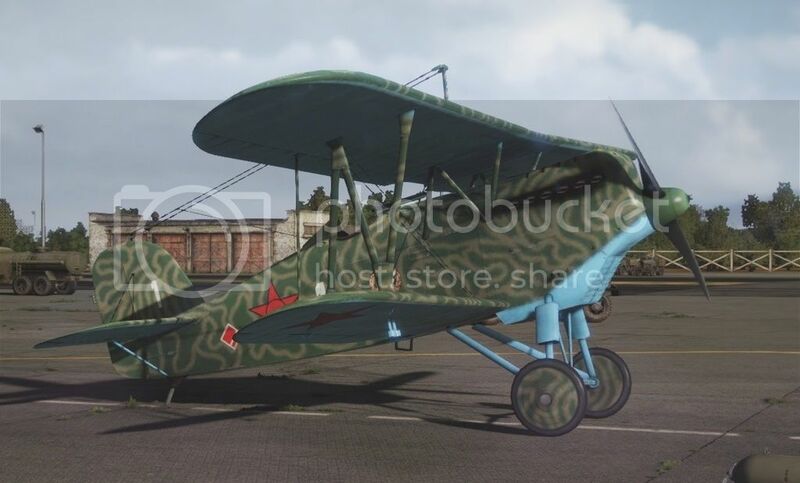 I have the 2PA as well on the RU server, but was not a tester there, so can't provide a picture of its Parade Camouflage. 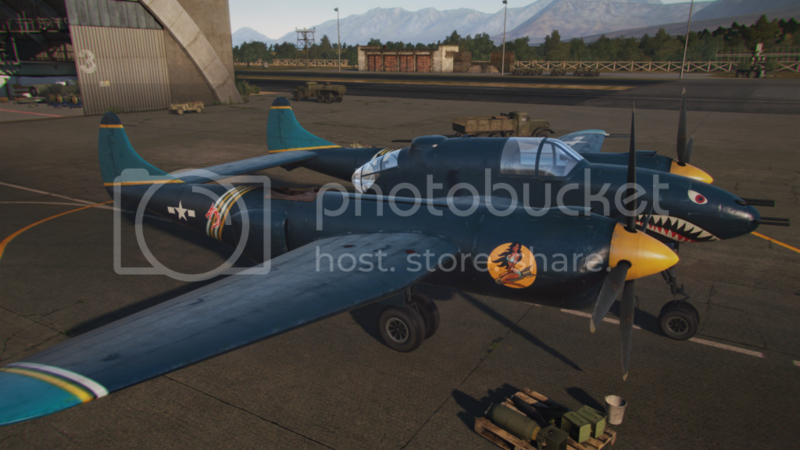 With the release of the Lockheed XP-58 Chain Lightning we have another tester paint scheme to showcase! The overall shading is a slightly darker blue than the US stock hangar blue. There are colorful stripes of yellow and teal on the fuselage booms where a clan symbol is located, the prop spinners are painted a matching banana yellow and the wingtips and vertical stabilizers are covered with a field of teal. A very striking and handsome aircraft; the reworked Jessica Rabbit "Red Hot" emblem goes well with it due to the emblem's circular field being a yellow that matches the prop spinners. Edited by MagusGerhardt, 21 August 2015 - 08:24 PM. ... the reworked Jessica Rabbit "Red Hot" emblem goes well with it due to the emblem's circular field being a yellow that matches the prop spinners. I liked the yellow/red emblem with a horseshoe and lightning bolt. Matches right up to the parade camo! I'll take a pic of mine when I remember. Edited by Suvillan, 06 September 2015 - 10:41 AM. Really sorry to hear that, man. I had a similar situation and determined it was better to spend the money to unlock the handful of missions that proved impossible to finish. I know there were several here on NA who did acquire their Chain Lightning for free, though, as I saw them in play prior to the tickets becoming available for purchase. Having put so much into the mission I think you would have been best served by biting the bullet and paying to unlock the ones you couldn't get on your own. 8-15 bucks for a tier VIII premium wasn't a bad price! Added Ju 87 to my OP. Since I'm playing WoWP again and noticed a free camo on my brand new Stuka, might as well do a little update. Thread is a real mess with many images missing (won't use Imageshack again). Can't seem to find any images of the Ju 88 in Dutch Air Force markings anywhere on the net, so here it is. Aircraft is a little to the right of the screen because I'm viewing the camo from the paint shop. Edited by Wolcott, 19 April 2016 - 01:27 PM. Some nice paint jobs, from way before my time here ... or do they still exist ?? Never seen them ? One of my favourites in the current game.